A young entrepreneur begins his journey toward a career in engineering. 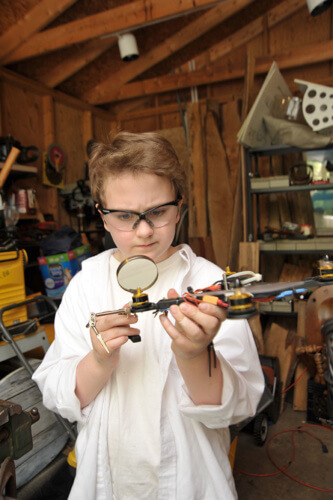 Riley Adams is your average 11-year-old; he enjoys playing games, building new things, and thinking about what he wants to be when he grows up. What sets Riley apart from his peers is his entrepreneurial enthusiasm and his drive to build a gaming empire. He calls his company “AerGamez,” and he produces drone games, with an obstacle course kit in the works. Riley’s mentor, Morgan Watson-Morris, a robotics development engineer at The Dow Chemical Company, would agree. “The simplicity of his design is quite good and I am impressed by his drive and the fact that he took the steps necessary to start this business,” Watson-Morris says of Riley’s work. Going forward, Riley has set his sights high. He hopes to continue expanding his online business to include even more drone games, as well as a new drone obstacle course. “I have ideas for everything; I just need to keep working,” he says. Riley believes the online platform will best help him to reach his target market of individuals between the ages of 18 and 25. He will consider pop-up displays or other in-person sales. 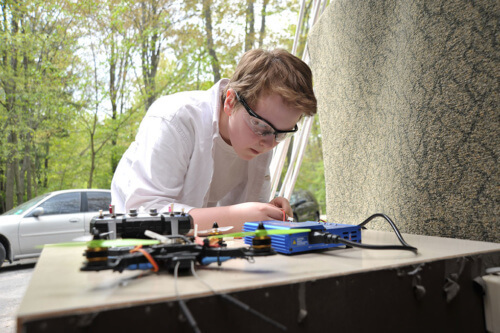 His dream is to attend Massachusetts Institute of Technology in Cambridge to study engineering and robotics. Developing a successful business plan did not come easily for Riley. He worked hard to figure out each tiny detail, proving that even from a young age, hard work and a positive attitude pay off. Big details don’t work until you figure out the small ones. Decide carefully who you choose to take advice from. You have to know how to sell your product or even the best product won’t reach the market. You can’t dive in without goals and ideas. For more information on Riley’s business, visit his website, www.aergamez.com.